Theodore Roosevelt, having overcome severe asthma in youth; gunfire, charging up San Juan Hill in the Spanish American War; a carriage accident, as President, in which a Secret Service agent was killed: yet again narrowly escaped death, most spectacularly, when shot in the chest from a few feet away, by a would-be assassin, on the night of October 14, 1912, as he campaigned for a third term on the new Progressive ticket. Roosevelt had just exited his hotel, on route to speak at the Milwaukee Auditorium when, having settled into his seat in an open car, he rose to acknowledge, with a wave of his hat, the wild acclaim of the crowd gathered round. At that moment, John Schrank - a psychotic who had been stalking Roosevelt for weeks - finally got what he thought a bead on the ex-President, and at almost point-blank range, raised his pistol to fire. Whether it was as he pulled the trigger, or a second before or after, Roosevelt’s secretary - an ex-football player named Elbert H. Martin - glimpsed the gun and leapt from the car on to the assassin. That is the moment famously captured by noted illustrator John Philip Falter: Roosevelt waving, Schrank firing, Martin leaping – which, all told, was just the beginning of one of the most extraordinary nights in American history. The rest of that evening was just as dramatic. The bullet, having been slowed and deflected by a metal eyeglass case and the bulky manuscript of Roosevelt’s speech, lodged near Roosevelt’s heart – but he did not know it. “Missed me that time,” he said when asked if he were hit, “I’m not hurt a bit.” Then, having first called out that his assailant be treated without violence, he calmly proceeded on to the auditorium where he was to speak. It wasn’t until someone pointed out the hole in his overcoat, in fact, that he realized he was shot, and bleeding. Still, he refused to be persuaded from delivering his speech: "I know I am good now,” he said, smiling. “I don't know how long I may be. This may be my last talk in this cause to our people, and while I am good I am going to drive to the hall and deliver my speech." Which he did, announcing at the outset – as he held a handkerchief to his wound – that he had been shot. “I shall have to ask you to be as quiet as possible,” he began. “The bullet is in me now so I cannot make a very long speech… I can tell you with absolute truthfulness,” he continued, “that I am very much uninterested in whether I am shot or not.” Roosevelt spoke, characteristically, for over an hour and only when he was done, allowed himself to be taken to the hospital, where he stayed for eight days. Shrank’s part in the story was also, in its way, incredibly theatrical. The reason he shot Roosevelt, he said initially, was because he disapproved his seeking a third term – but really, he had known he was supposed to kill Roosevelt since the night McKinley died. He’d had a dream, he said, in 1901, in which he was told by McKinley that it was not Czolgosz who murdered him, but Roosevelt. “This is my murderer,” McKinley said, bolting up in his coffin to point at Roosevelt. “Avenge my death!” The dead president, Schrank explained, told him that his blood was on Roosevelt’s hands, and that Roosevelt had killed him just so that he might become President. McKinley’s ghost, in fact, had come back just a month before, to instruct Shrank again, albeit in the finer points of Presidential tradition. "Let no murderer occupy the presidential chair for a third term,” he ordered. “Avenge my death!" Shrank insisted that not only did he act against Roosevelt for McKinley’s sake, but, like Joan of Arc and Moses, for God’s – and, too, for George Washington’s. Not surprisingly, Schrank was found to be insane, and committed for life to an asylum. Roosevelt recovered, and some three weeks later, lost to Wilson, but beat Taft. Yet what is remembered most about that campaign, perhaps, is how Roosevelt, bleeding from an assassin’s bullet but an inch from his heart, insisted that “it takes more than one bullet to kill a Bull Moose” - and so stood before his audience, arguing for an hour the justness of his cause. 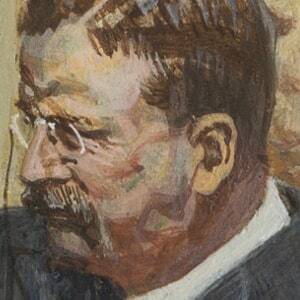 Watercolor and Oil, on board, signed, being the Assassination Attempt of T. Roosevelt; approximately 15in by 10in.